I’ve been using wview with my WH1080 weather station for some time (actually 2 of them). My main setup has been using my server, and every now and again the WH1080 would seem to lock up and nothing could get data out of it. The solution was to drop it’s power, on reboot it would all start working again. However wview also seemed to introduce lockups of it’s own and the only solution there was to reboot the server (not ideal). So when it came to setting up a second weather station (in a remote location) I needed something a bit more stable and started looking at alternatives. I was doing this on a Raspberry PI and found wview. After installing it sometime last year it seemed pretty stable (although the WH1080 still manages to lockup). Back to my house and I’ve finally had enough of missing weather data. One thing I really liked with wview was the ability to pull the archive data if the weather station had been running when the machine hadn’t (providing the USB hadn’t locked up), I really recommend looking at wview if your starting out. I’ve already covered setting up weewx on a Raspberry PI and I’m not going to post about my exact configuration here. 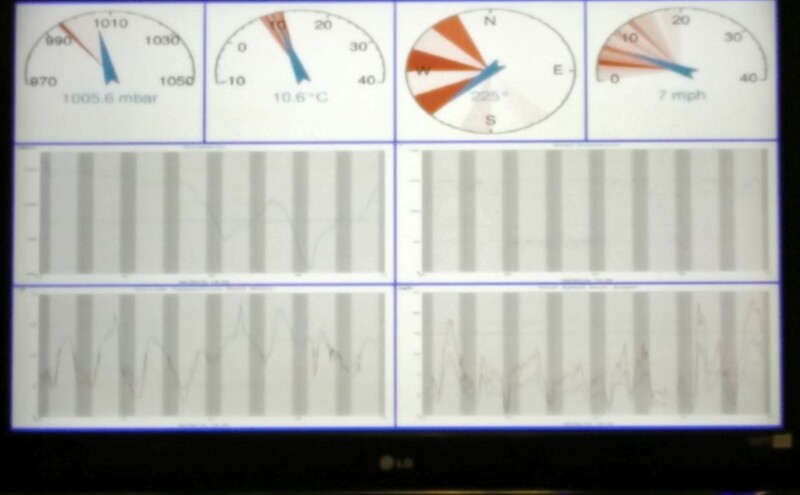 Instead I’m going to share my Python code for displaying the various graphs and gauges straight to the TV. 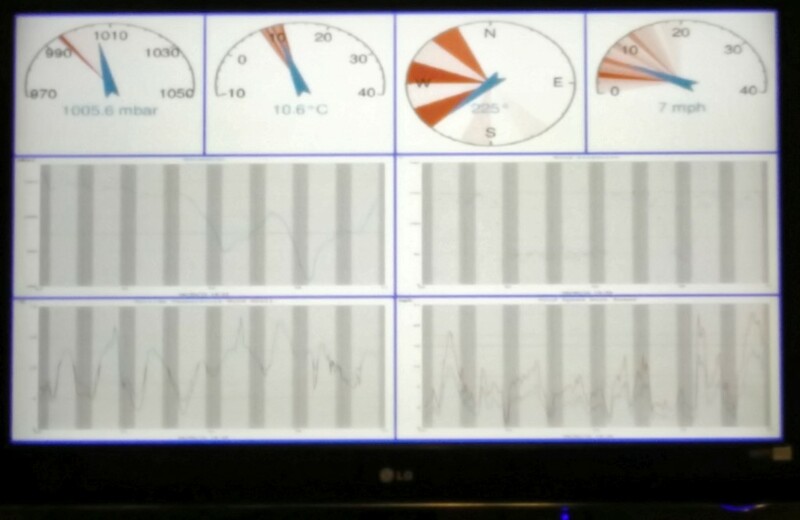 At the moment I have my weather PI connected to the TV via HDMI. This may change later and then I’ll have to adjust the code to pull the images to another pi before displaying them (I have a similar project for displaying webcams already). So a few things before the code. It’s my first real attempt at using classes, so my code will be more than a little scattered. You need to have python, pygame, wview, (and for this exact code Bootstrap for wview but you could just change the file paths to the Standard guages and graphs), mysql and wview configured for mysql. I have this started using an init script (added below). This runs the python program as root, I need to find a way to run this as a normal user (but that will affect point 5&6). This program checks mysql is able to be connected to and restarts mysql of not. It also checks the freshness of the index.html file (not the best way but a quick way) to make sure wview is running keeping the files upto date. If not it reboot the PI, this causes the weather station to reboot so if the USB locks up the whole system resets fixing it. "Initializes a new pygame screen using the framebuffer"
# Check which framebuffer drivers are available. "Destructor to make sure pygame shuts down, etc." # 600 = 10 mins. # 7200 = 2 hours. "Init for fileman. Nothing to do atm." "Destructor for fileman. Nothing to do again." #wait 30 secs and try the connection again. "When sysvinit send the TERM signal, cleanup before exiting"
"check if we've been reboot in the last 30 mins"
"We've reboot in the last 30 mins, ignoring"
# Description:       The python script queries mysql and file ages, so does not rely on mysql as a backup way to kick it. -- -c "exec stdbuf -oL -eL $DAEMON $DAEMONARGS &gt; $LOGFILE 2&gt;&amp;1"
Download and write to SD Card the debian image for Raspberry PI. Change to root using sudo su – alternative use sudo in front of commands. Using sudo su – is bad, but I always do it. Package python-configobj is not installed. Package python-cheetah is not installed. Package python-imaging is not installed. Package python-usb is not installed. During the install you’ll be asked several configuration questions, fill them in (You can always edit the config file later if you make a mistake). For the maplin WH1080, Select the FineOffsetUSB. wxengine: The archive interval in the configuration file (300) does not match the station hardware interval (60). stats: stats database up to date. You should also have /var/www/weewx loaded with files. As we haven’t yet installed a webserver though you can’t view them. We’ll install Apache2 Server to handle our webpages. This setup does leave weewx running as root, not really something you would do for a system running on the internet. but outside the scope of securing your server for here. 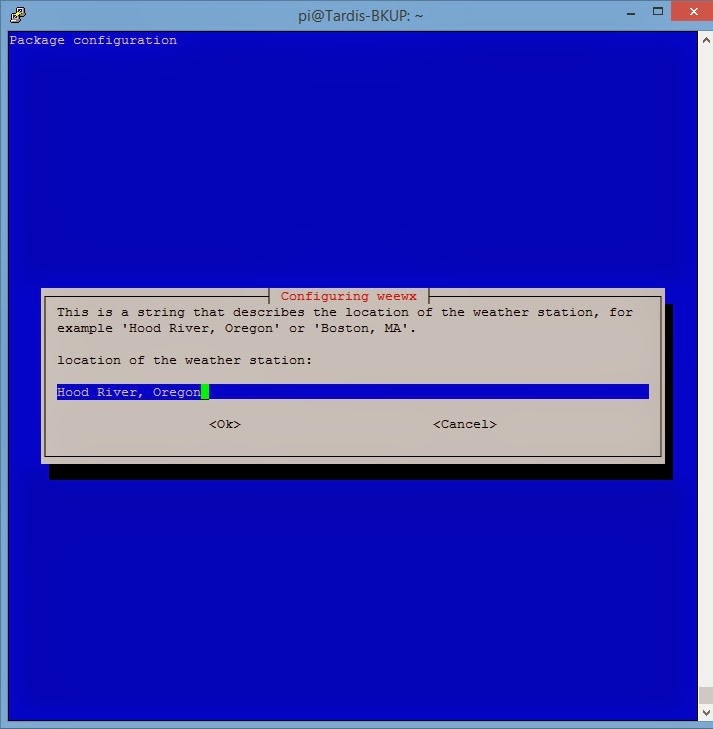 Checkout http://www.weewx.com/docs/usersguide.htm#installing for more info on installing, problems and further guides for configuring your weewx installation. Also checkout http://davies-barnard.co.uk/2013/12/weewx-rasp/ for a better looking skin template (the link is in one of the comments).